Lieber and some of her students from James Monroe High School. Photo by Lee Choo. Lieber proudly displays many of the awards she has received. Photo by Lee Choo. CSUN alumna Isela Lieber, named one of five California Teachers of the Year, poses in her classroom at James Monroe High School. Photo by Lee Choo. Lieber helps a student with an assignment after school. Photo by Lee Choo. Isela Lieber was 17 years old when she left behind everything she knew. In 1988, she set out on her own from Guayaquil, a small city in Ecuador, for New York City — without a high school education or a word of English. She traveled thousands of miles to New York, where she lived for two and a half years, working at a factory for $3 an hour while learning English. Then, the teen traveled for three days by bus to Los Angeles. 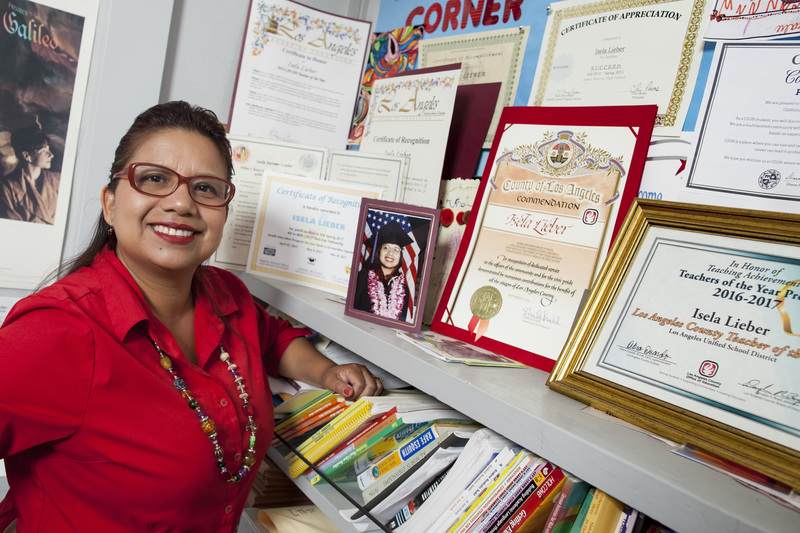 Once in LA, she worked as a housekeeper, took night classes and earned her GED certificate in order to achieve her dream of becoming a teacher. In 1998, Lieber transferred to CSUN from Los Angeles Valley College. Hard work and perseverance paid off for Isela Lieber ’00 (English), M.A. ’02 (Educational Administration), both as a student at California State University, Northridge and as an educator: in October of 2016, state officials recognized her as one of five California Teachers of the Year, after she’d been named one of six LA County Teachers of the Year and one of 22 LAUSD Teachers of the Year. Lieber teaches English Language Development at James Monroe High School (just a few miles east of CSUN), where her students are primarily immigrants. She said that sharing similar experiences gives her empathy for her students, since she understands the obstacles they face. “She always tries to inspire other students to do better. She always goes out of her way to see others succeed,”Quiñonez said. Of the students lingering in her classroom after school, many female students had come to browse the dresses Lieber had brought in for them to wear to the school’s senior prom. Some dresses were donations from other teachers, and some were from Lieber’s own closet. The ninth- and 10th-grade teacher also leads a school club called Succeed, which guides teens — particularly those who would be first-generation college students — through the college application process. Carlos Martinez, a member of Succeed, never had Lieber as a teacher, but said she has had a strong impact on him. Despite her family’s circumstances during her childhood in Ecuador, she gained access to books and developed a strong interest in reading, Lieber said. By 9 years old, Lieber was reading advanced classics. Lieber said that this background is why she encourages her students to read as much as they can, and that reading sparked her passion for teaching. Lieber has been teaching for 18 years, and her love for teaching has not dimmed, she said. Lieber said she hopes to pursue a doctorate in the near future. Lieber also recalled the impact CSUN professors had on her at the undergraduate and graduate levels.